Check the shuffleboard tabletop every few weeks and adjust as necessary.Usually shuffleboards are set up with a slight concave in them but some people prefer a perfectly flat board. (See the picture below with a straight edge across the surface) It is recommended that you can slide a piece of standard paper under the center of the straight edge as shown below. However on the outside edges the paper would not pass under the straight edge. This is a general rule when first setting up aboard. 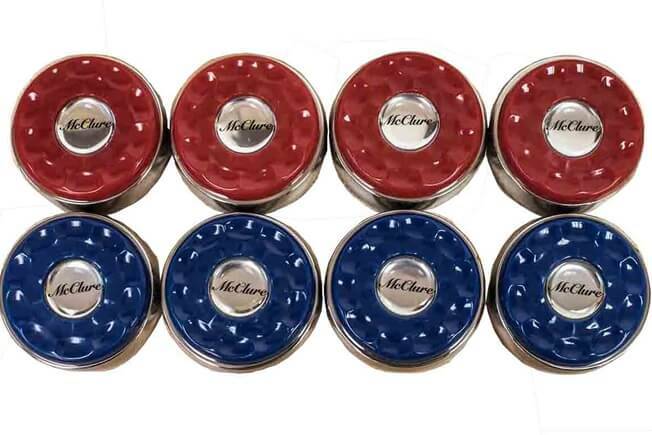 Next slide some pucks down the table and see how they drift or how much they drift in towards the middle of the board. Then adjust to your personal preference. Before waxing a board for the first time, it should be cleaned with a Cleaner or Polish. We recommend a traditional environmentally safe blend of water with a 1/4 cup vinegar plus a few drops of oil—makes for a much better wood cleaner and polish. The vinegar pulls the dirt out of the wood, and the few dropsof oil lubricates the wood so that it doesn’t dry out. The best oils to use are those that have the longest shelf life. Olive oil works well.The best choice of all is the liquid wax jojoba, because it never goes rancid. It is found in most health food stores. This will remove foreign matter from the surface of the board. 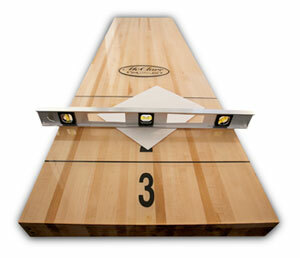 For Polymer Finish shuffleboard tables. 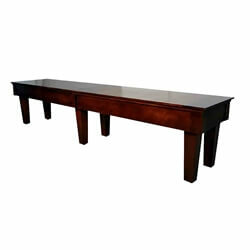 You simply can clean the table with any multi purpose cleaner or even a glass cleaner. The Polymer finish will require less maintenance in cleaning but it does shift and pull a little more on the boards. So you may need to adjust the climate adjusters more often. 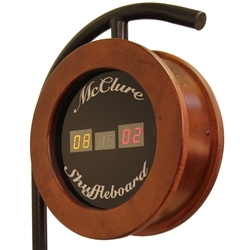 The McClure board all use a traditional finish but we have a UV cured 100 percent solid finish material so it is sealed very similar to polymer but still retaining the natural feel of the wood surface. You can clean the same as a polymer board and skip directly to step 3 or 4.For both tables apply the cleaner with a soft cloth and buff to a clean polish removing any debris from the wood. This should be done 2 to 4 times per month depending on the use. For Traditional Lacquer type shuffle boards. You can apply wax over any finish-penetrating oils, varnish, lacquer, or polyurethane. But, only buy a high-quality, cabinetmaker's wax, one designed specifically for wood furniture. It should also be applied with a towel. Application for the wax is identical to application of the polish, buff lightly with a dry towel until the surface is as smooth as ice. Once again, depending on the use of the board, 2 to 3 times per month is usually recommended. 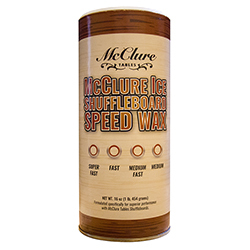 You can even use a furniture wax type spray to clean and polish the board prior to apply the speed powder. You can use a combination of spray wax and silicone that you may want to buff before apply the speed powder. 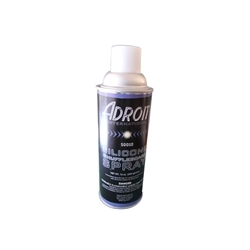 For ULTIMATE SPEED you may now apply Adroit Silicone Spray. Apply and let is set for 5 minutes.On most new boards the first time you will need to buff or polish with a soft towel the silicone on the first applications or between cleanings. You may find after the first time you can simply spray the silicone on the board and let it fall down on the surface. You are now ready to apply Adroit Speed Powder or another brand of powder.To apply simply sprinkle a light coat like a small snow fall. Then see how your pucks slide, if you get too much powder the pucks will actually plow the powder. So a light coat is best. Technically in a tournament they will only allow one full coat of the board during the complete game. Players will and can throw up powder from the gully but no fresh coat can be applied during the game play.